Jim Hawkins (Treasure Planet). 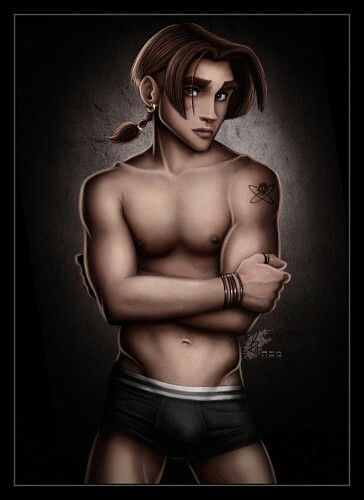 Jim Hawkins from the डिज़्नी movie Treasure Planet as an underwear model, drawn द्वारा David Kawena.. Wallpaper and background images in the क्लॅसिक डिज़्नी club tagged: disney jim hawkins treasure planet david kawena underwear model deviantart fan art. This क्लॅसिक डिज़्नी fan art contains कूबड़ा, हंक, त्वचा, skintone, नंगा रंग, आंशिक तन, निहित नग्नता, स्कंटोन, नग्न रंग, आंशिक नग्नता, and अव्यक्त नग्नता. There might also be छह पैक, पेट, एबी दरार, सपाट पेट, पेटी पेट, and छह पैक abs.